So you've shot a perfect video for family reunion, training, interviewing, etc. Everything looks good until it's time to edit. Your heart stops because you notice annoying background noise in the video. Maybe it is minor, but it is enough to destroy the entire video. If you want to remove the background noise in your video before you deliver or upload them to Facebook, YouTube or Vimeo, you can have Video Editor a try. Some people may recommend Sony Vegas or Adobe Premier Elements to you, but these tools are heavy and not easy to handle for green hands like you and me. Plus, they cost a fortune. 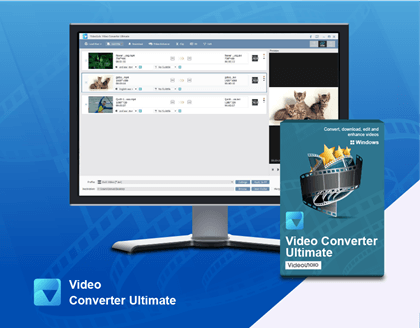 If you want to find an easy-to-use and cost-effective tool to delete background noise, Video Editor is an ideal choice. Follow the steps below to know how this tool works. Video Editor can detach the audio from the video and remove background noise with built-in "Audio Denoise"
Launch Video Editor and select "FULL FEATURE MODE"
Import your videos and drag it to the timeline. Now you can play the video and listen for background noise. Then, right click the video in the timeline and choose "Audio Detach". The software will separate the audio from video. Now double click the separated audio track to bring up the audio editing panel. Then, tick "Remove background noise". Now you can click "EXPORT" button to save your video to compute or upload it to YouTube, Facebook or Vimeo. After filling out the output descriptions, click "Export" button and the program will convert the video to the format you need. When it completed, open the video and listen again if the background noise has been eliminated. Notice: When you check the video, you may find the inevitable truth that removing background noise from video doesn't work as perfect as you imagine. That's because it is almost impossible to completely remove the noise like people talking in the background, cars, birds chirping, doors slamming, foot traffic, etc. The only noise that is easy to remove from videos is white noise which means a constant, predictable, never-changing noise, such as the noise from an air-conditioner or computer fan. So what do you do then? Step 1. Import your video to Video Editor and drag it to the timeline. Then right click it and choose "Audio Detach". Step 2. Delete the audio when the video part and audio part are separated. Step 3. Import the music you like to use as background music and drag it to the timeline. Or you can choose the provided music on the program and add it to the timeline. Then, move and adjust the length of the music to make it fit for the video. Step 4. Export video with the customized background music.